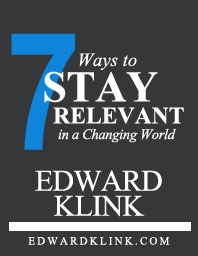 Edward Klink is currently a marketing professional with over 20 years of proven business experience—from Fortune 500 firms to start-ups—in B2B business development, strategic and tactical planning, creative development and project management. He’s fortunate to have had the opportunity to work on some great projects with talented colleagues and collaborators. For a decade he worked in downtown NYC writing and editing hundreds of articles and creating revenue-producing books, special reports, and digital content for business professionals—from Wall Street investment firms to Main Street boutiques—on topics including high-net-worth prospecting, management, niche marketing, selling, networking, branding, social media, client psychology, and team-building. His knack? Creating engaging, take-action content based on research and real-life tales of perseverance and achievement. Prior to that, he managed and trained teams responsible for marketing new financial products and services to institutional and retail high-net worth clients. He created and led dynamic inter-department programs in client service, Series 6 licensing, product knowledge, marketing, sales, and communication skills. When it comes to careers, he is a strong believer in the power of relationship-building, adaptability and uncovering the hidden job market. He holds a Master of Science degree from Stevens Institute of Technology, a Bachelor of Arts degree from Seton Hall University, and is a graduate of the three-year Securities Industry Institute leadership program at Wharton. When not working he can be found fishing, scuba diving, writing and reading history and adventure books.